Its March 2014 and spring is in the air, flowers are blooming, and Turkeys are Gobbling. This is the time of year the Borill Boys get out of the house we’ve been trapped in all winter, and head out with the kids for Youth Turkey Weekend. 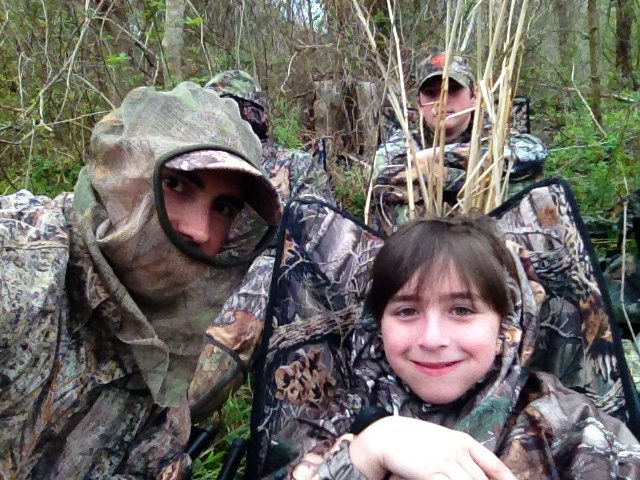 Troy Borill is continuing a 3 year tradition with his son Gentry and Ryan Borill is starting a new tradition by taking is son Luke on his first hunt ever. There is nothing like two dads getting to share a timeless tradition with their sons. Its a cool overcast morning on March 15th which most experienced Hunters know its not the best conditions for Turkey Hunting, but don’t tell that to the kids. When we arrived in the Basin the wind was nonexistent and you could hear for miles. We decided we had a better chance of killing a turkey if we split up so we quickly grabbed the gear and moved down an old logging road covered with green clover and tons of Turkey sign. Ryan and Luke set up a double bull blind which was great for concealing an active 7 year old Boy who was still a little nervous about being on his first hunt in the middle of the Basin in the pitch dark. However, the little hunter would not see or hear a turkey in the early morning hunt, and would quickly have to change positions later. Troy and Gentry continued moving down the logging road to hunt the edge of a cut over by an old loading zone where a couple of Gobblers usually roost. While they were setting up the half blind some owls were hooting and 3 Turkeys that looked like clumps of mistletoe in the tree started Gobbling a few minutes before fly down time. We started what seems to be the favorite part of our hunt when we pull out the calls and the wings from Turkeys past and start to simulate what sounds like Turkeys pitching down from the trees while imitating fly down cackles. Right away the Gobblers turned ansi from the calls and pitched down away from us. We realized quickly the hunt turned into a good old fashioned Eastern Turkey chess match. After a half hour of silence we heard what seemed to be a interested gobbler a long distance away, but he wouldn’t provide a regular response to our calls. We were set up in the direction we thought the Turkey would surely come, but we were quickly caught offguard to our left by a huge Eastern standing at 30 yards in full strut spitting and drumming while dragging his wings. The bird spotted us and started to walk away but it was to late when Gentry turned to his left put a bead on his head and put him down at a confirmed 52 yards. Not only was it an unbelievable shot, but it was an unbelievable bird measuring 11 1/2″ beard, 1 3/4″ spurs and 23lbs. After taking a quick picture we gathered our gear and headed to meet back up with Ryan and Luke to help the new hunter bag his first bird. but there was nothing but silence after the hens had moved off. Just when Luke was starting to get wiggly in the half blind, we heard a loud stick break from behind us and we all froze. Ryan grabbed Luke’s arm and gave him a slight squeeze and whispered in his ear “There’s a Turkey behind us.” “Don’t move!” He gave a quick look at Troy and Gentry and they knew it was about to be game-on. After a few seconds a Jake ran out into the food plot followed by 2 more. Luke quickly became overwhelmed with adrenaline which was clearly evident by his heavy breathing and intense focus on the animals, and after his eyes became big he whispered “Dad, theres a Turkey!”. 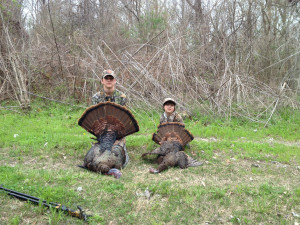 After the Turkeys moved into the food plot and we got a good look at them Troy whispered “Shoot the one in the middle”. Luke whispered the same thing “shoot the one in the middle”. Luke was ready to raise his gun to his knee, but we needed the last Turkey to move behind a tree before he could raise his gun. 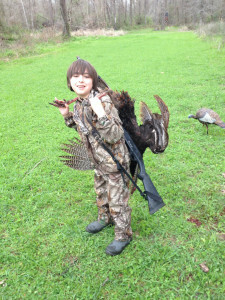 The last Turkey finally went behind the tree and Luke raised the gun to a small pad that was strapped to his knee. 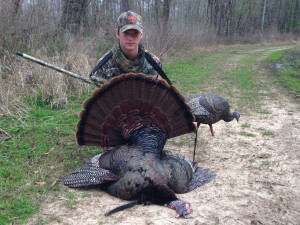 He quickly lined his eyes down the barrel and put the bead on the Turkeys head, and after Ryan removed the safety he pulled the trigger. There was a few things that made this hunt special. Not only were we able to take a record bird, take down two Eastern Turkeys in a day, but we were able to share a boys first hunt as a family while having success. It was a moment that we would all remember for the rest of our lives. Louisiana youth weekend is a great way to get kids involved early, start family traditions and experience a true past time like Turkey Hunting.